news, updates and more geotechnical information. You might have noticed that some familiar buttons have popped-up in the site. Yep, these are the ones! Since every site nowadays needs a social presence in order to be more noticable, we wouldn’t want to be left behind. In other words, we are very eager for you to introduce us to your friends! However, you probably have noticed these as well right? So what’s the point of having two sets of the same buttons on a page? Well it’s not actually the same set. The set of buttons on the footer of the site have to do with the social aspect of Geotechpedia in whole. If you like the site, send a kind word for us over the internet kind of thing. 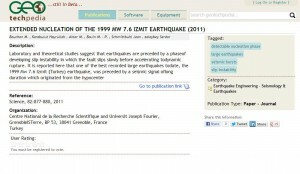 The latter set of buttons, appear in the Item view of a Publication/Software/Equipment record. The purpose of this set of buttons, is to share the information about the actual record. 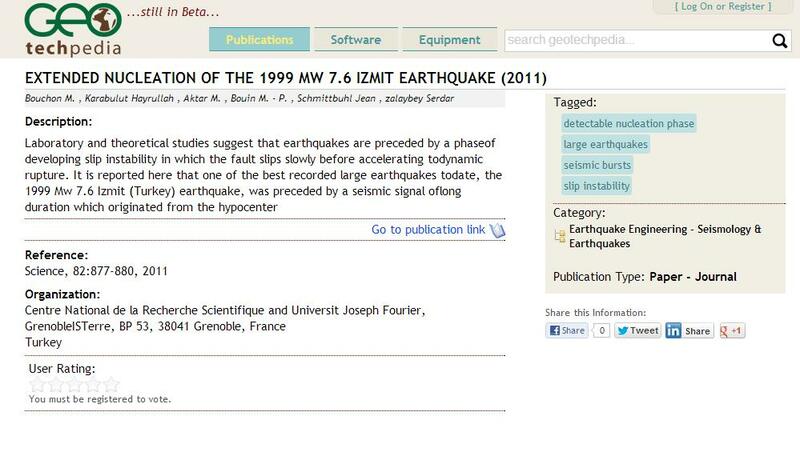 If for example, while browsing thourgh the site you come across theExtended Nucleation of the 1999 MW 7.6 IZMIT Erthquake, and find it interesting, you might want to share it with other people. Just head over to the right pane of the Publication and click on the share option you prefer. If you choose more than one you will make us even happier! Copyright (c) 2012-2015 Geosysta Ltd.